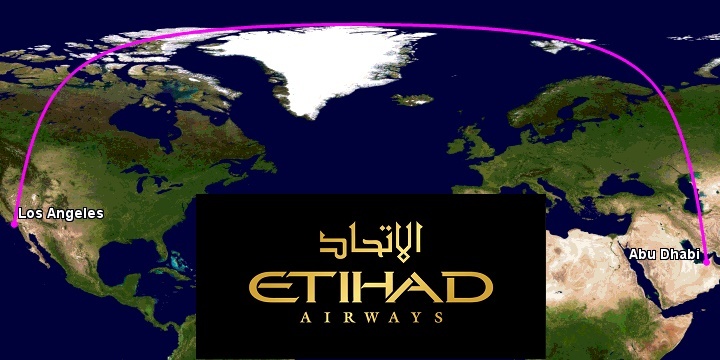 Welcome to this report on the worlds 3rd longest flight by distance: flight EY170. Etihad's daily Boeing 777-200LR non stop service between Los Angeles and Abu Dhabi. At 13,502 kilometres in distance only two other flights are longer, being the Qantas flight between Sydney and Dallas, and the Delta flight from Atlanta to Johannesburg. On this flight I was flying in the business class cabin on the B777-200LR, an ultra long range variant of the B777 which was acquired by Etihad from Air India with this route in mind. After a stop at the In n Out burger for some plane spotting near LAX, I headed back to the TBIT terminal and proceeded through security towards the Star Alliance Lounge. I had my boarding pass issued already by American Airlines on my previous sector so there was no need to check-in. Despite the name, the Star Alliance Lounge is actually operated by Air New Zealand, and it's one of the nicer lounges at LAX. The best feature in my opinion is the open air terrace with views of the tarmac and aircraft landing and starting their take off roll. It's great to sit out there on a sunny day sipping Champagne watching planes! Which is precisely what me and my traveling companion did on this fine spring day. The lounge itself is very large with a good selection of food and drink. It has some nice showers too which I made use of during my transit. It was nice to start a 16 hour flight fresh!. Eventually after about 3 champagnes on the terrace, the flight was called for boarding and I headed to the gate where I found 'A6-LRC'. This aircraft is an almost 8 year old B777-200LR, previously operated by Air India. After Etihad received the aircraft from Air India they completely refurbished them with the standard Etihad seating as featured on the B777-300ER. The business class seats are all forward facing in a staggered arrangement. All feature fully flat beds and personal entertainment screens with Audio Video on Demand. There are 8 First Class, 40 Business and 177 economy seats in total. Welcome on board - Champagne?? For the most privacy the A and K seats are closest to the window and the shape of the seat gives you a semi enclosed space. You have 20 inches of seat width and 73 inches of pitch, or so Seatguru tells me anyway. I was a little disappointed that there is a break in the windows at my seat, so I had to lean forward to see out. Perhaps 7A would be a better option if I could get it next time. But never mind, most of the flight was spent with the blinds closed anyway. We pushed back about 17 minutes behind schedule, I noticed an Air Berlin A330 which I later found out operates seasonally to Dusseldorf. The skies were clear as we crossed California and soon flew overhead Las Vegas, Nevada. The bowl of hot nuts arrived and so did another glass of Champagne! I do apologise but I forgot to include a copy of the menu on this sector. The menu was fairly typical Etihad though, a bunch of 'Kitchen Anytime' items which included various hot dishes/breakfast etc, plus the main meal menu which was basically a 3 or 4 course dinner. On Etihad in business on long haul you can eat what you want, whenever you want. It's completely on demand. After dinner I asked the crew for a pair of pyjamas and the 'turn down' service, where they put a mattress on the bed for added comfort. These 'enhancements' on long haul were introduced last December, I now have 2 pairs of Etihad business class pyjamas from this trip. They are one of only a few airlines that offer them in business. Throughout the flight I was using the onboard wi-fi, at a flat rate fee of approximately $15 USD for unlimited use. I was tracking the flight on flightaware.com and noticed stormy weather over the centre of the United States on the radar ahead. Sure enough we encountered some turbulence and I watched on flightaware as the crew skilfully diverted us around the worst of it. By the time we crossed the Canadian border things had smoothed out and I went to sleep for a number of hours. When I woke up I figured it was breakfast time, so I ordered some yoghurt, juice and coffee. This was then followed with the full hot breakfast of beans, tomato, chicken sausage, scrambled egg and hash browns. The hot breakfast came with a selection of pastries and jam as well. It was quite nicely presented although the eggs were a bit powdery looking. Fortunately it tasted quite ok and was very filling. I was one again thoroughly impressed with the flexibility of Etihad catering in business class, eat what you want, when you want. It's perfect. By this stage we were winging or way across Scandinavia and I settled back in watching movies again. Eventually I decided it was the equivalent of lunch time so I started having a few wines and I ordered a pie with mash! I have read online reports of food running out on Etihad in First and Business class but I was happy to report that on this service that was no issue. The crew had plenty of available food and were happy to serve it. They were quite friendly throughout however I found the lavatories were not kept tidy at all... and at times they were in a disgraceful state. I also noticed that I regularly had to wait for a lavatory to become available so perhaps the ratio of seats to toilets isn't great.... either that or I was on a flight full of people with weak bladders. The flight was soon coming to an end as darkness fell outside. On this flight we left in daylight, flew through the night, flew through a whole day again, and back into another night. Quite extraordinary!! Just before top of descent I changed out of my pyjamas and back into my street clothes in preparation for the arrival. The captain advised that due to congestion at Abu Dhabi we would have to enter a holding pattern, so what was going to be an on-time arrival instead became 30 minutes behind schedule. In total we were in the air for around 16 hours and 30 minutes. Certainly what you would call 'ultra long haul'. Yet despite the length of the flight, I felt quite refreshed. Having your own space with flat bed and food and drink on demand with loads of entertainment means that it's not a tiring experience at all. We arrived at the old Terminal 1 in Abu Dhabi and were soon disembarking. I thanked the crew for a good flight and headed into the terminal and into a fairly lengthy immigration queue. About 30 minutes later I was in a cab and headed to the Sofitel Abu Dhabi Corniche. All in all a great flight and I have found myself to now be a big fan of Etihad Airways inflight service and product. Simply a great way to fly! It is funny that you also track your flights on flightradar like me using the Wifi over the States, its a shame that cloud and patterns only show up over the united states and mexico and the rest of the world does not update this information to the public. Always puts me at ease when I know what might be ahead. Great trip report again.